We are pleased to announce the availability of FORMED, an online service for accessing thousands of Catholic videos, audios and ebooks On Demand anytime, anywhere! As a member, you will have access to entertaining movies, inspiring audio talks, informative bible studies, and much more. We are providing this resource free of charge to help our members learn and grow in their faith. You will also be able to easily access any featured content that we are promoting within our community from time to time. So please join us. Also once you have signed up, don’t forget to download the free iOS or Android app to put FORMED at your fingertips. We hope you will enjoy this incredible gift and please spread the word to others. The Bonds of Marian Love prayer group is held in the Parish Center chapel every Friday night from 7:30 PM to 9:30 PM. For more information about any of the Bond’s activities, please contact Jonathan (201) 726-6172 or Leonidas Aliaga at (947) 354-1137. Classes for Consecration to Jesus through Mary have begun. 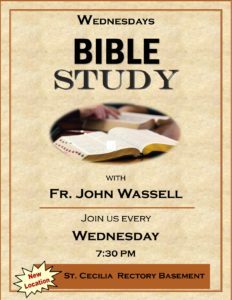 The classes are held on Thursdays at 7:30 PM in the Parish Center Chapel. These classes are free. For more information regarding any Bonds’ activities, please contact Rosalia at (908) 494-6168 or Leo at (949) 354-1137. The Hope Family Store is a Catholic religious gift, music and book shop featuring a St. Therese Mission Center and mini-Cafe for visitors. We currently have Stations of the Cross booklets, rosaries, Lent/Holy Week spiritual reading books and journals, along with Easter gifts for children, teens and adults. The Hope Family Store donates ALL proceeds to family-strengthening charities including St. Cecilia’s Parish. Please note: St. Cecilia Gift Shop has relocated to the Hope Family Store. Sunday at 10:30 AM in the Parish Center. Sunday at 10:30 AM in the Rectory basement. at 7:30 PM in the Parish Center Basement. 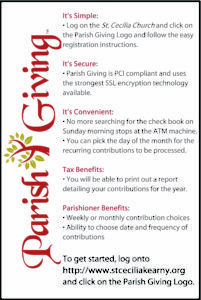 available in the Parish Center). 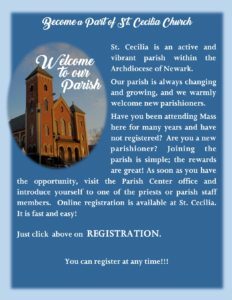 1:30 PM – 3:00 PM in the Parish Center, behind the church. to a Kearny resident twice a month. Proof of residency in Kearny, NJ, and registration with the food pantry is required. You can only register at ONE Food Pantry in Kearny, NJ.